Vance is one of my favorite writers. The man could come up with the most outlandish ideas and turn them into great stories. Nopalgarth, which is basically a novella, is a great example. What if there were invisible creatures squatting on your head that fundamentally altered your perception of the world? And what if there were a war raging from star to star to exterminate these invisible creatures, and it was discovered that Earth was their home planet? 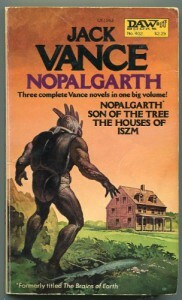 It sounds dumb, but Vance makes it terrifying. One of his better and more accessible short stories.